PD Kim Do Hoon who finally completed the shooting for The Moon Embracing the Sun after several ups and downs shared his thoughts over the last few days on Twitter. 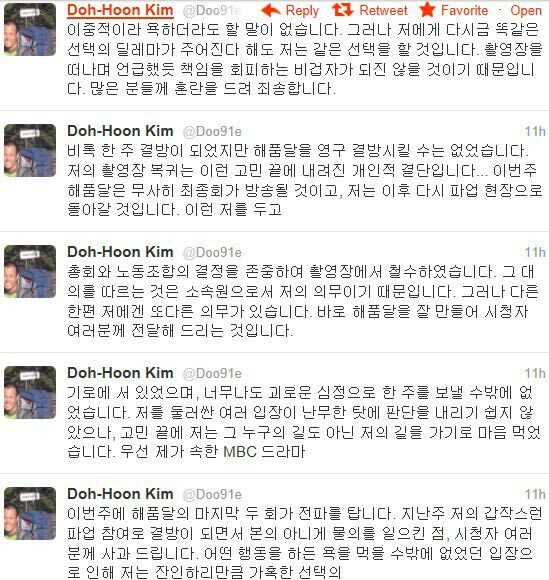 On the morning of March 12th, 2012, Kim Do Hoon wrote on his Twitter account, telling his complex state of mind over a series of events over the last week from participating in strike, stoppage of The Moon Embracing the Sun broadcasting, to return to the filming set. On March 6th, 2012, PD Kim and other directors suddenly announced the participation in the strike. As the result, the finales of The Moon that Embraces the Sun that originally scheduled to broadcast on March 7 and 8 were forced off air. But PD Kim Do Hoon returned to the set on the afternoon of March 6th, 2012, and participated in the remaining filming days. The final 2 episodes of The Moon that Embraces the Sun is broadcast on March 14 and March 15 of 2012.